Personal hand-held radiation monitor is ideal for searching at plant exits and material access areas, as well as contamination and background monitoring. The small size, light weight, and long battery life make it ideal for searching vehicles that require extended search times. The PRM470 hand-held is a popular choice for locating radioactive sources and measuring intensity in the field. The TSA PRM470 uses low power electronics to provide up to 17 hours of continuous operation from the rechargeable batteries. The PRM470 also features a self-test during power up, automatic background count and user determined alarm settings. Detection information and parameters are easy to read on the backlit display that can be used in dark or light conditions. Settings may be configured from the front panel, or from a personal computer. The TSA PRM470 is available in three configurations; Gamma, Neutron or a combination of Gamma and Neutron detection. Gamma provides detection of ionizing radiation and Neutron provides detection of Special Nuclear Materials (SNM) while the combined Gamma and Neutron provides the most powerful detection capabilities for radioactive isotopes even in shielded materials. 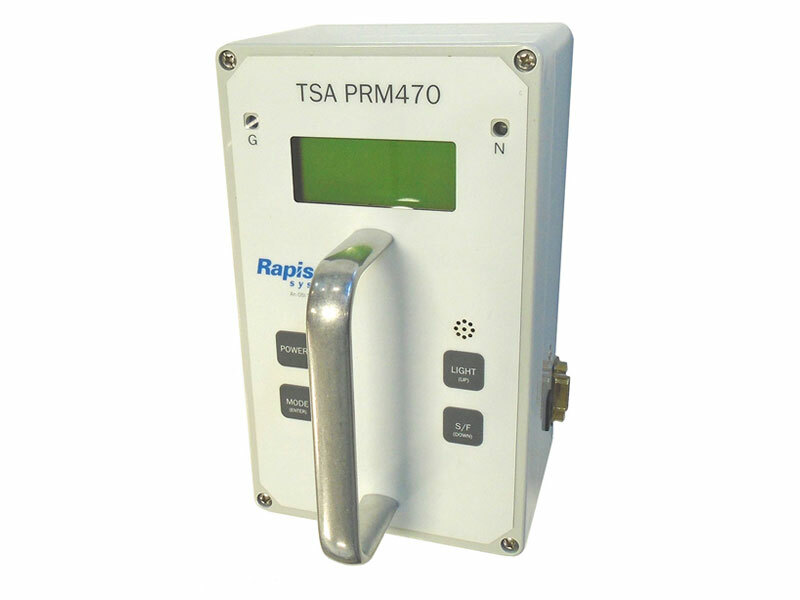 The TSA PRM470 is typically ready to use within 20 seconds of start-up. The PRM470 features an audio and visual search/find mode to assist in pinpointing radioactive sources. The PRM470 uses a motion switch to automatically switch from background to search mode when the instrument is moved. After the instrument has been at rest for a preset duration, it will revert to background update. The unit may be programmed by the user to scale the display to CPS, µSv/hr or mR/hr. This conversion is not energy compensated. Therefore, the value displayed is only an approximation of actual dose rate. As detected counts increase, so does the frequency of the audio signal helping to pinpoint the location of the radioactive source. LED indicators respond in similar fashion, flashing faster as counts increase. On gamma and neutron instruments, the LED indicators also assist to identify the type of radiation being detected (a red LED for gamma, and blue LED for neutron radiation). A serial port is available for managing detection parameters and controlling security levels for the individual unit from a computer.